Global Teq Training Academy: CAPM – the Certified Associate in Project Management. 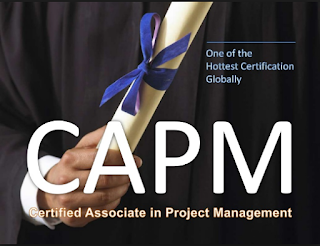 CAPM – the Certified Associate in Project Management. If you are considering applying to get CAPM certified, you might be wondering whether or not it is worth the time, cost and effort to do so. Let’s look at a few important things one should know about CAPM. The CAPM is the Project Management Institute (PMI)’s entry level certification for project managers or people who are interested in entering the field of project management. CAPM does not require the project management work experience that the PMP does. The multiple-choice test that candidates must pass in order to become CAPM certified is not as difficult to pass as the PMP exam. To apply for the CAPM all you need is a secondary education (high school or the equivalent). This means that people who are currently enrolled in college or university and want to have project management certification before they graduate, and can start applying for jobs can get CAPM certified before graduation. This might help these individuals score entry-level project management jobs upon graduation. ü At least 1,500 hours experience OR 23 hours of project management education. If you study PMI’s framework to take the CAPM exam, you will also be studying the same framework that is needed to pass the more difficult PMP exam. In order to study for either exam, you will need to know PMI’s framework according to the PMBOK. This means that time and effort spent on studying for the CAPM will not be wasted if you also eventually want to become PMP certified. If you already have a way that you can get those 4,500 hours of professional experience leading and directing projects that you need in order to take the PMP exam, you should wait until you have that experience, then go for your PMP. There is no reason to get the CAPM if you can see a clear path toward getting your PMP. If you do not have the work experience to attain PMP certification, that certainly does not mean “it’s the CAPM or nothing”. There are numerous other options available to you if you are interested in learning about project management. In fact, many people believe PMI’s framework, which is based on the waterfall methodology of project management, is quite dated and not as effective as other current project management frameworks. One such option is Scrum Master Certification, where you will learn about Agile Development using Scrum. Agile is a very popular methodology where projects are completed in iterations. Agile has an agreed-upon Agile Manifesto to which Agile project management principles are based. I have used this project management methodology myself and found it both effective and scalable. The IT Infrastructure Library (ITIL) is a set of practices for IT Service Management (ITSM) that offers a wide range of certifications. While these certifications are currently more popular for practitioners in the United Kingdom than they are in the United States or other parts of the world, they are also worth investigating if you are interested in a career in information technology.